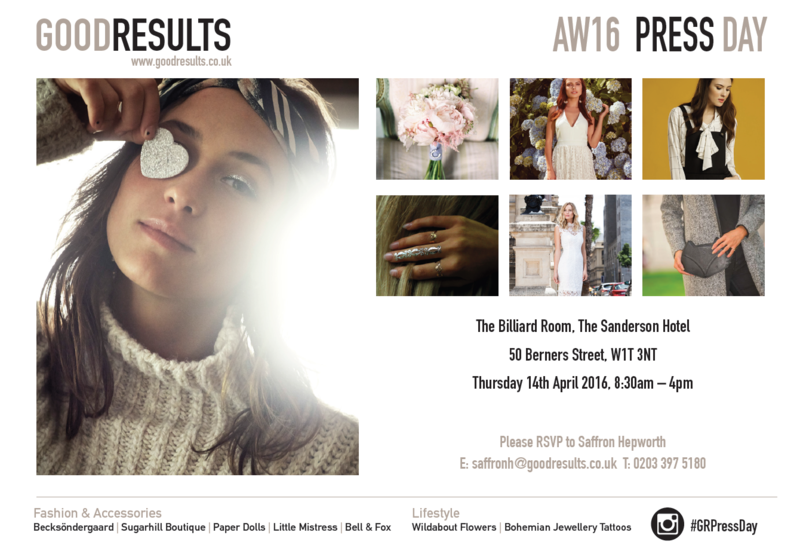 Good Results welcomes you to come down and join us at our AW16 Press Day being held at The Sanderson Hotel on Thursday 14th April, doors will open from 8:30am-4pm. Stop by to see the must-have AW16 collections from fashion, accessory and lifestyle brands including Becksöndergaard, bell&fox, Bohemian Jewellery tattoos, Little Mistress, Paper Dolls, Sugarhill Boutique and Wildabout Flowers. We hope to see you Thursday for a catch up over a lovely cocktail!